I’ve found that there are many in the Church who suffer from what one might call: me-sim. My spirituality, my this, or my that… Where I can be happy, where I can be comfortable, where can I benefit. That focus is wrong. Totally wrong. It isn’t about you, and what you want, or what you can get out of serving God in His Church (1 Cor 3:23). Look outward. Look out and see a lost, suffering, sinful and needy world, a world that is dying for want of Christ. Go into that world, and proclaim and live out the Gospel, both by thought, word and deed (St Mark 16:15). Do this, whether they are willing to listen to you or not. As John Wesley once rightly noted, ‘Catch on fire and others will love to come watch you burn’. As I said yesterday, it was an extended weekend with Monday being Heritage Day. Friday, I was called to go and do some trauma debriefing. Saturday was a full day of refresher training (Chaplaincy) with the Emergency Service, which I volunteer in doing (btw, if you’re a Christian (Ordained or Lay) and are sick of twiddling your thumbs wondering about rituals, liturgical rites and/or the hybridisation thereof, then go down to your local Hospital, Fire Department, Police Station or School and volunteer to do some counseling and ministry. Go in the name of Jesus Christ to those places where sin is most acutely felt, and make a difference. You’ll be surprised at the need… It is massive. People are hurting indeed). Sunday was a blessed Mass, though numbers were slightly down given the long-weekend and many going away. Then I got home to the ‘Archbishop John Hepworth’ story, a leak to the Aussie press who had a field day. I posted it on my blog. 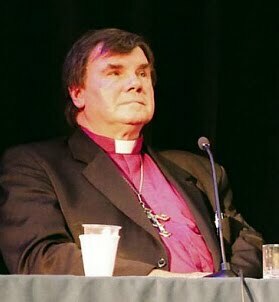 It’s almost laughable that my calling for Archbishop John Hepworth to be honest, open, reconciled and to work with (as much as lies within him) those that he is estranged from, constitutes ‘trashing’. I don’t know much about the man except that which I read in the press like the rest of you. I am not privy to any inside information. I am a Parish Priest who blogs on Church matters and news. I met the Archbishop once (or at least saw him once) at the funeral of the late Bishop Trevor Rhodes. The rest is out there in the secular media, news, and the blogosphere for all to see. Why he doing and saying the things he is, why he is accused of fiddling with Church funds whether that was in 1974 or later, why he did what he is said to have done to fellow Churchmen is all beyond me. What I’ll say is that reading about it leaves a rather bad taste in the mouth and makes for a pathetic Christian witness. And, if I may add, for an innocent, Archbishop John Hepworth certainly seems to be accused of much, and to my mind has far too many detractors, and Christian detractors at that. Of course, he is assumed innocent until proven otherwise. It’s the behavour and attitude being displayed that is questionable and bothers me most. ‘A bishop then must be blameless’ (or ‘above reproach’ as some other versions have it) – (1 Tim 3:2). That’s not me. That’s plain Scripture. How calling the Archbishop to answer and/or explain constitutes ‘hatred, psychological and spiritual torture and religious fanaticism in its worst form’ is simply beyond me. That is an emotive and irrational response. Unhelpful. What I see going on is being done in an orderly, legal and professional manner. The only one perpetually running to the media is Archbishop John Hepworth himself. None of it is about taking sides, but rather about the truth. A search for the truth. ‘God offers to every mind its choice between truth and repose. Take which you please; you can never have both’ – Ralph Waldo Emerson. So there’s now a lot happening in the Church in Australia, and we would all do well to sincerely pray for them, and give them a chance to let God undertake, and in the end, all will be well. No sooner had I posted the above news (and yes, my call for Archbishop Hepworth at the very least to admit that there is some sort of a problem and/or misunderstanding and to state that he is both willing and working towards sorting it all out – one doesn’t hear anything of the sort does one?) than the phone rang. I was called out to a house in the Strand. It was raining as I drove and when I got there, the EMS and Police where already on scene. A 3 month old precious little girl had passed away. She lay there, on the bed, in pink, eyes – empty eyes – staring blankly without registering, her spirit, well away from the mortal remains. It’s hard to try to make sense of such a death. Almost impossible. Just as hard is trying to tell the bereaved, the devastated parents, that God is still good… and that He cares. But try, one has to. Because only God is able to make sense of the senseless. At times like this, we need to seek and know God’s peace and indeed draw upon His power and strength. Getting home just after 21:00, switching on the blog and reading the com box as the Hepworthian comments quickly filtered through, that simply paled in comparison to the traumatic world I had just come from… an infinitesimal comparison. Last night a Mother of one of our congregants passed away. She was a member of another Anglican Church. The Minister never came. I was called. It didn’t matter. I went. Her funeral is Friday and I’ll be doing it. She was never on our Parish Roll… But see if I care! Jesus calls us to serve as His hands, His feet, and His voice. Now, if you do that, there won’t be enough time in the day to stress about yourself and what you need or can gain from life – spiritually or otherwise. Churchianity is so far removed from real Christianity. If your focus is the Cross and all it requires of you, then you won’t need to be looking around for direction. It’s already there. In front of your nose. Being Jesus to another is all but a conversation away. See one of the things I’ve learnt from the Bishop who now shepherds us, is it is not about what the Church can do for you, but what you can do for the Church. The Church belongs to Christ. Each of us has been given some rather unique and individual talents and abilities to use (1 Cor 12:28). And we do well to use them in and for Kingdom work. The Church’s mission is saving those perishing, bringing them in, and steering them to the safe harbour that is Heaven. It lies within each of us to fulfil that mandate. And the Bible teaches that everything written from cover to cover in Scripture can be summed up with two statements: Love God and Love Others. The Traditional Anglican Communion will conduct a special internal hearing in India next month into allegations of financial irregularities at the Australian arm of the church involving Archbishop John Hepworth, which were first raised by a priest he had tried to suspend. Archbishop Hepworth yesterday said he had not been told what charges he was facing and would not attend the tribunal in New Delhi on October 6. The acting primate of the breakaway church, India-based Archbishop Samuel Prakash, said the allegations against the Adelaide priest were yet to be tested. “This matter was presented by Bishop David Robarts, a standing TAC bishop in Australia, and (is) under consideration,” he said. Bishop Robarts yesterday refused to say what allegations he had raised with the church’s international leadership, but said he hoped the issues would be resolved at the tribunal. Archbishop Hepworth, who was instrumental in seeking his church’s reunion with Rome, was forced to resign as the global head of the TAC in April, seven months after he raised allegations that he had been raped by Adelaide Catholic priest Ian Dempsey and two others in the 1960s. A meeting of the church leadership in South Africa this year found Archbishop Hepworth had tried to suspend Bishop Robarts from the church on “insufficient” grounds.